Anglers choosing our Extreme fishing holidays Thailand will have the opportunity to fish for five of the largest freshwater species found on Earth. Fishsiam Ltd offers the best of extreme fishing in Thailand with five day trips specifically designed for visiting anglers to experience monster fishing in Thailand at its best. The Extreme angling Thailand packages offer anglers the chance to fish for Giant Siamese Carp, Mekong Catfish, Giant freshwater stingrays and Arapaima or Pirarucu. The five day holidays start at Bungsamran Lake in Bangkok and allow anglers to fish for the largest Carp species in the world, the Giant Siamese Carp. Bungsamran Lake is Thailand’s premier carp fishery and holds monster fish in the excess of the magical weights of 100kg’s+. Whilst fishing in Bangkok at Bungsamran Lake the angler will also be fishing for other monster species such as Mekong Catfish, Striped Catfish and Chaophraya Catfish (Dog eating Catfish). These heavy weight Thai monster catfish are some of the hardest fighting freshwater fish in the world and will test the angler’s endurance and stamina to their absolute limits. After fishing for a full three days at the record breaking Bungsamran Lake anglers will then be transferred to either IT Lake Monsters or Palm Tree Lagoon in readiness for Monster fishing for Arapaima and other predatory species the following morning. 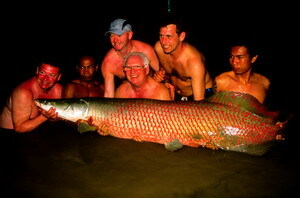 The Extreme fishing holiday Thailand gives visiting anglers the opportunity to fish for yet another of the worlds largest freshwater fish the mighty Arapaima or Pirarucu. The Arapaima /Pirarucu is the worlds largest scaled freshwater fish and is a highly ferocious predatory species non-indigenous to Thailand. Monster Arapaima in excess of the world record are present in both IT Lake Monsters and Palm Tree Lagoon offering anglers the best of Extreme fishing in Thailand for Monster fish. In addition there is a plethora of other exotic Monster fish in both venues for anglers choosing the Thailand Extreme angling holiday. The final day of the holiday will be spent at either the Ban Pakong or Maeklong River targeting the legendary Giant Freshwater Stingray. Anglers fishing at the Maeklong River or Ban Pakong River will be angling on the same record breaking stretches of tidal river as made famous in recent National Geographic shows entitled Hooked Monster Fish Giant Stingray and Hooked Monster Fish of Thailand. Anglers visiting these mighty Thai rivers will have the opportunity of Monster fishing for Giant Stingrays in what could be described as the most extreme freshwater fishing scenario in the entire world. Monster Giant Stingrays are found in both of these vast rivers of record breaking proportions. Anglers Monster Fishing for Giant Stingrays on our Thailand Extreme angling packages will experience the exhilarating thrill of doing battle with what is possibly the world’s largest freshwater fish. Battles with these prehistoric leviathans routinely last for hours testing anglers and tackle beyond limits previously encountered. Extreme fishing at both the Ban Pakong and the Maeklong River is undoubtedly the worlds most physically demanding freshwater fishing experience and is truly the stuff of angler’s dreams. 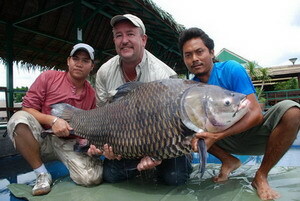 Anglers will begin Monster fishing for Mekong Catfish and Giant Siamese Carp at Bungsamran Lake in Bangkok. Monster fishing will commence at 08.00am and see anglers doing battle with monster fish throughout the day. After angling for a full day anglers will be transported back to serviced apartments for overnight accommodation. Anglers will commence fishing at 08.00am and fish for a full day for Monster Carp and Catfish at Bungsamran Lake in Bangkok. After battling monster fish for a full day the angler will be transported back to serviced apartments situated close to the lake. Angers will continue Monster fishing for Mekong Catfish and Giant Siamese Carp at Bungsamran Lake in Bangkok. angling will conclude at 18.30pm when the angler will be transported to Ratchaburi province and overnight accommodation at a choice of either Palm Tree Lagoon or IT Lake Monsters. Anglers will begin Monster fishing at Palm Tree Lagoon or IT Lake Monsters and will fish for a full day for Arapaima /Pirarucu and various other native and non-indigenous predatory species. Angling with a combination of lures, livebaits and deadbaits anglers will fish for one of the world’s largest freshwater fish the Arapaima. In addition to the Arapaima anglers will also have the opportunity to catch various other monster fish including Chaophraya Catfish, Redtail Catfish and a whole host of weird and wonderful predatory monster fish. After fishing for a full day anglers will be transported to the tidal river of their choice in readiness to monster fish for stingrays the following day. The final day of our Thailand extreme fishing package will see anglers Monster fishing for a full day at either the Ban Pakong or Maeklong River in an attempt to capture what is quite possibly the largest freshwater fish on the planet. Angling for a full day for Giant freshwater stingrays will allow anglers to experience the most extreme freshwater fishing adventure available in Thailand and quite possibly catch that fish of a lifetime. Monster fishing at either the Pakong or Maeklong Rivers will allow anglers the chance to fish for native monster fish in wild and unexplored tidal rivers and allow them to experience an authentic taste of Thailand’s wonderful culture and stunning scenery. After Monster fishing for a full day the angler will be returned to their choice of Bangkok accommodation. Our Thailand monster angling packages can be modified to you the clients exact angling requirement and tailored to suit any other venues shown on our site.